TheMaverickSpirit is a blog where we talk about how to make money online to live a lavish life by doing something that you are passionate about. We cover guides related to WordPress, SEO, Make money online, Social media marketing, Digital marketing, Affiliate marketing, Email marketing, and much more..
Home » SEO » SEOprofiler Review- Complete SEO Tool to Improve Your Google Page Rankings! SEOprofiler Review- Complete SEO Tool to Improve Your Google Page Rankings! Before moving ahead to SEOprofiler review, I just want to know whether you want to improve your Google page rankings or you are looking for a best keyword research tool or do you want to track backlinks of your competitor’s website? If you nodded your head even ones! You are at the right place today. We all know how important SEO is for a website and nowadays an SEO software is really important if you wish to do SEO right in order to achieve best possible results. However, SEO software does not come cheap! Apart from it, you still require some basic SEO knowledge to properly use the SEO software tool. This is where SEOprofiler kicks in with a motto to offer Pocket-friendly all-in-one SEO software tool! It not only provides all the important SEO functionalities but also makes it easier to use for both professionals and beginners alike. Today, I’ll take you through a review of the SEOprofiler all-in-one SEO software and its features. SEOprofiler Features – What are they? Below are the highlighted features of SEOprofiler and how each one of them can help the ranking of your website on SERPs. Website Auditing helps in discovering any sort of errors on your website that can potentially drag the ranking of your website down. Well, the website auditing feature by SEOprofiler not only helps in discovering both high-priority and low-priority errors in your website but also helps in resolving them. High-priority website errors include – technical errors on your website that give a negative signal to search engine bots crawling your website. Low-priority errors include – issues within the content of your website which when resolved can help improve the ranking of your website. Web Auditing can also be done for the mobile version of your website because keeping the mobile version of your website free from errors is also really important! As about 60 percent of global searches come from mobile devices these days and search engines like Google give utmost importance to the mobile version of a website while ranking it. Website Auditing also helps in understanding the hierarchy of internal linking on your website. Internal linking is a very important and powerful SEO tactic and if done properly can really benefit the ranking of your website. SEOprofiler checks the structure of internal linking in your website and also provides you information on the pages and images that are linked the most within your website content. Search engines love websites that load really fast so as to give users the best experience possible. Performing an audit on your website allows you to find the load speed and response time of your website and in case the speed of your website is slow, you can also find the reasons that may be slowing down your website and resolve them as well. and if some setting on your server is affecting the performance or ranking of your website negatively. Everyone knows that keywords are really important for ranking of a website. Not just for ranking, but keywords are also important to make your website content visible for people in the first place. If it has huge search volume. If there is less competition. If it is used by your competitors. If it can get your website ranked easily. If it is a long-tail keyword. Even though there are free keyword research tools out there, they do not help in finding the best keywords for your website and its niche easily. SEOprofiler makes sure to recommend you with keywords that match all the above criteria and also makes keyword research a very easy task for everyone. explicitly check out the keywords that are used by your competitors and also find the difficulty to rank for each keyword as well. search for long-tail keywords, which are really beneficial for ranking and can also find similar keywords that match your searched keyword as well. Many people make the mistake of creating unhelpful backlinks by using automated comment tools and also by commenting on blogs, forums, and social media websites. These backlinks will not add any value to your website’s ranking and in turn, will harm the search engine ranking of your website as well. SEOprofiler helps in building helpful links by suggesting you with backlink sources that will not get your site penalized for malicious backlinks. The link building tool provides a list of sites based on sites that link to your competitors and sites that can content on similar topics. It also helps you in keeping track of existing backlinks to your website as well. You can also submit your website links to authority sites and local directories to build valuable backlinks. Using the Ranking Intelligence tool, one can find the ranking tactics deployed by competitor websites. This will help website owners in finding details like the most visited pages, high-value keywords etc. used by competitors. Based on analyzing your competitor’s strategies, you can also create a similar strategy to boost the ranking, traffic, and earnings of your website. You can also perform a ranking intelligence search on your website to find similar data about your website and to understand the type of content that receives a lot of visitors. Social media is the best place to spread the word about your website and to get new visitors with less effort. Not many SEO tools out there focus on social media management, however, SEOprofiler offers you with a dedicated set of social media tools to improve your online presence. find if anyone is talking about your website on social media and if people are asking questions related to your website’s content on social media. know if there is positive or negative publicity about your website, if any, and can also stay regularly updated about the latest happenings in the social media space related to your website niche. As mentioned in the introduction, SEOprofiler aims at providing the best SEO tools in a very pocket-friendly pricing. Standard Plan: The Standard plan is priced at $69.95 per month and is best for single website owners. The features provided by the Standard plan include audit for up to 20,000 pages and keyword rank checks for 500 keywords daily. Smart Plan: The Smart plan is priced at $99.95 per month, however, for a limited time SEOprofiler is offering the same plan for just $1 for the first month. The benefits of the Smart Plan include an audit of up to 50,000 pages and rank checking for up to 1000 keywords per day. Professional Plan: Priced at $249.95, the Professional plan supports up to 15 users and also offers 2500 keyword rank checks and 150,000-page audits per day. Enterprise Plan: The costliest of all is the Enterprise plan priced at $999.95 per month and offers support for an unlimited number of users. Up to 750,000-page audits and 10,000 keyword checks are supported per day. SEO is the only way to market your website’s content well and to bring the targeted audience on to your website. 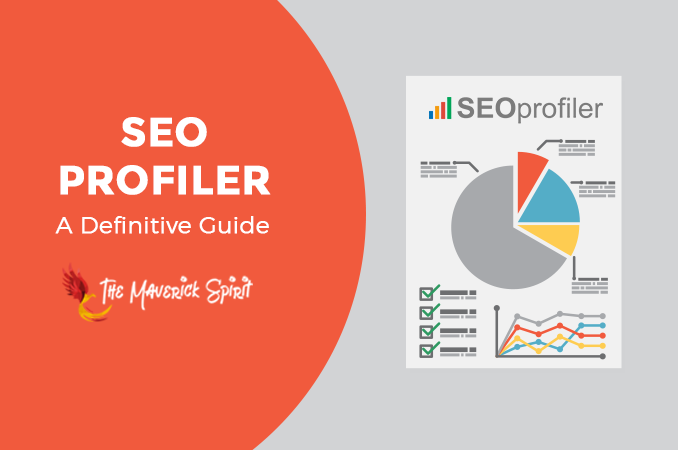 Even though there are many SEO tools out there, what sets SEOprofiler apart from the rest is the set of professional level SEO features and tools that it offers. The features are priced very competitively making SEO tools more accessible to everyone and the functionality of the tools within SEOprofiler are also designed with all kinds of website owners in mind so that they can follow the best SEO practices without needing to have much background knowledge. Also the $1 that SEOprofiler charge for new users makes it a must try SEO tool. Hope you liked our SEOprofiler review. If you are already using SEOprofiler, do leave a review below to help others know about the experience of using SEOprofiler. Infolinks Review – How to Make Money from Your Blog with In-Text Advertising? Ankita Arya is the CEO & Co-founder of TheMaverickSpirit - A site launched with a vision to encourage people to live their dreams rather than accomplishing others. Blogger by Choice & Traveller by Heart! Don't Miss The Exclusive Earning Strategy! We hate spam and promise to keep your email safe! How to Revert to the Old Classic WordPress Editor and Disable Gutenberg? March Monthly Update Report  Traffic Boost by 32% + WPForms Giveaway! February Monthly Update Report  Organic Traffic Boost by 81% & Blogging Events! How To Start A Blog? A full-time blogger & Digital Marketing Expert from Bhopal. An early adopter who loves to try out various Digital, Blogging & Social media tools along with exploring some cool iOS and Android apps. A full stack developer who loves working with WordPress and doing it the right way. Follows one common goal while developing Themes & Plugins i.e. to keep things as simple as possible for end users to operate things with ease.